I can appreciate the reverence of critics and film buff to this film. As shot by the great Stanley Cortez (Magnificent Ambersons), the film is bristling who ominous moody southern Gothic noir-like suspense. There are half a dozen stand alone stunning shots which are simply some of the most memorable shots in cinema history. Unfortunately, it feels as if the cinematic world at large remembers these few shots more than the film as whole. Which in terms of all storytelling is curiously spotty, and inconsistent. Let’s start at the beginning. 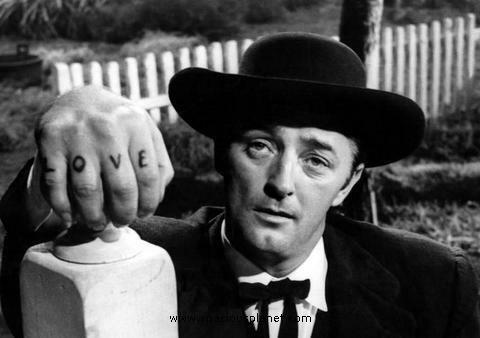 Robert Mitchum plays Harry Powell a psychotic evangelical preacher who thinks he speaks to God, which justifies to himself his murderous rampage. While in prison his roommate Ben Harper (Graves) confesses to leaving a fortune from a bank robbery somewhere in his country home. Once out, Harry seeks out Harper and the lost money. Using his good looks and exploiting her susceptibility and fear of God Harry courts Harper’s widow Willa (Winters). But we, the audience, knows where the money is. Young John Harper has it, hidden in his sister doll. At this point Laughton works on a level of fear of the audience for John. Harry doesn’t know where the money is, but John knows he’s up to no good. Reminiscent of Shadow of a Doubt, Laughton’s direction uses the best Hitchcock technique to create a gritty sense of oncoming doom. While Shadow of a Doubt is precise with it’s narrative, Laughton and writer Agee attempt to create a larger scale chase between John and Harry. The episodic nature of the narrative structure creates an uneven shifts in momentum. At the halfway mark, John and his sister escape into the wild and come into the company of a an elderly widow Rachel Cooper (Gish) who becomes the protector and mother figure to the children. During this chunk Harry is completely absent. This comes too late in the picture. One of the key images of the film is the awesome shot of Rachel, in the fashion of the Western genre, sitting on the front porch in a rocking chair brandishing a long shot gun, protecting her home stead. This is the revered siege sequence. In the scope of cinema history I always felt the entire movie was this siege. Yet, Harry versus Rachel is less only about 5mins of screentime. 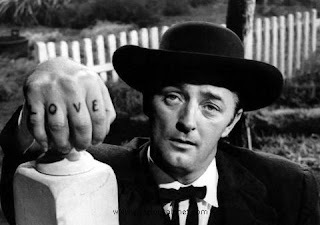 There’s nothing disappointing or ‘misremembered’ from Robert Mitchum’s performance though. He’s consistently awesome and diabolical in the picture. His ‘love/hate’ speech is deservedly iconic – and famously imitated by Spike Lee in Do the Right Thing. Hunter is also as famous for being actor Charles Laughton’s first and only film he directed. Laughton, of course, was British, and famous for playing in period costume, both characters roles exploiting his enormous girth as in Spartacus as well as iconic literary heroes and villains such as Quasimodo, Captain Bligh, Rembrandt, Claudius and Henry VIII. It’s also an unlikely choice of subject matter, a distinctly ‘American story’, which satirically demonizes the Christian fundamentalist movement in America, and cleverly uses the tropes of two different genres, film noir and the American western. I watched this film a while back, I thought it was pretty good. I really love this film as it is a mix between a genre film and a personal film. Just as Welles' pictures had odd tonal shifts (The Trial and Mr. Arkadin) I attribute this to the filmmaker using genre as a base for their vision but subverting it for thematic purposes. This film has an odd mix of horror, humour, suspense as well as the two genres you brought up. The humour is the most interesting as it doesn't feel like it should be funny but I think Laughton was being very critical to the religious establishment and it's extreme duplicity. It is an odd film, that is for sure. The ending feels like a demented Disney picture and I like it - alot.